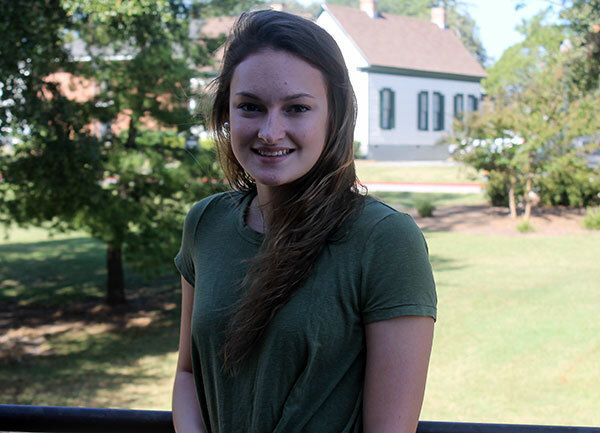 Julia Davis, a student leader at MGA's residential program for dual-enrollment students, is working toward an Aerospace Engineering degree and, she hopes, Navy flight school. High School: "I spent my freshman year at Veterans High School before enrolling in the Georgia Academy at Middle Georgia State. I was involved in Beta Club, French Honors Society, and the swim team." Family: "My parents, Mike and Pam Davis; siblings, Katie and William Davis; my Welch family, Brian Warren and Susan Collins; and, of course, my cats." Employment: "I’m a tutor on the Cochran Campus, a teaching assistant in Organic Chemistry, and I work as a Georgia Academy ambassador and orientation leader." Degree Objective: "I have already completed the requirements for an Associate of Science degree in Natural Science from Middle Georgia State. I plan on pursuing a Bachelor of Science in Engineering with a major in Aerospace Engineering." Career Goals: "I want to be a pilot for the United States Navy. At MGA I’ve been able to gain an insight into the world of aviation and I’ve completely fallen in love with it. Flying for the Navy would allow me to not only fly the most advanced aircraft in the world among the most skilled pilots, but travel the world as well." She chose Middle Georgia State University because … "I wanted to enroll in the Georgia Academy. I saw that this program would provide me with countless opportunities to grow not only academically, but as an individual. I was bored with my high school and was ready to take on the responsibilities of a full-time, residential college student." The greatest thing she discovered about Middle Georgia State was … "The new family I’d become a part of. The Georgia Academy is a relatively small program that encourages a tight-knit community. During my first few months here I made friends that I became incredibly close within a short amount of time. As the year carried on, these relationships became the closest friendships I’d ever had in my life. But the family extends outside of the Georgia Academy. The Cochran Campus of Middle Georgia State is small enough that you can make friends within your classes or even in the cafeteria or just walking around campus. The feeling of community within the entire campus and especially the Georgia Academy is something that makes Middle Georgia State University unique to other schools." Her greatest academic experience so far as a Middle Georgia State student has been … "Participating in University research. Last fall, I was a volunteer for Entomology research and had the opportunity to participate in beekeeping. Being able to work with the bees, harvest the honey, and make products from the beeswax was an exciting set of experiences that allowed me to try something completely unlike anything I’d ever done before. In the spring, I was a research assistant for the University’s Computational Chemistry class. It was an incredibly rewarding experience to be able to apply my knowledge of theories I’d learned in class to investigating proof of these theories in research." To her, “greatness” means … "Discovering what your passion is and then chasing those dreams to become the person you want to be." In five years … "I see myself participating in the Navy’s flight school in Pensacola, Florida, and receiving my “wings of gold.” With more training, I’ll be assigned to my first squadron and will have the responsibility of leading that squadron. For the rest of the duration, I will continue to serve in the United States Navy and build a new family of my own."